All U.S. model building codes require new one- and two-family dwellings and townhouses to be equipped with fire sprinklers. This course is a 3-hour, self-paced program that was developed to assist fire, building, plumbing and mechanical inspectors and others tasked with inspecting residential fire sprinkler systems. 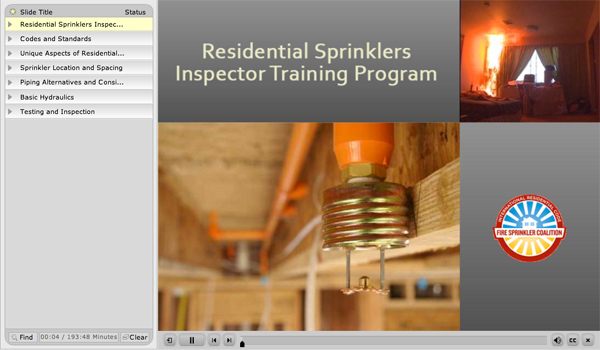 The program was designed to help individuals with little or no prior technical knowledge about residential sprinkler systems by explaining applicable codes and standards, basic system design, installation, equipment and inspection considerations. You can offer feedback on the program here.